With the Certificate in International Cash Management (CertICM), you will become a trusted expert, highly valued for your ability to provide solutions and deliver best practice in domestic and international cash management. 1. 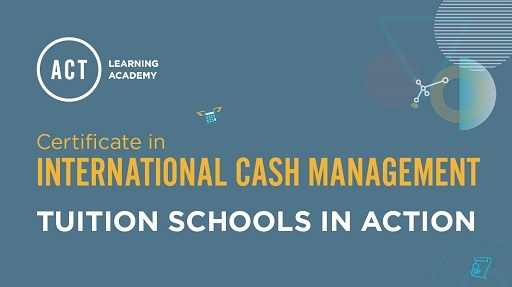 IS THE CERTIFICATE IN INTERNATIONAL CASH MANAGEMENT RIGHT FOR YOU? The Certificate in International Cash Management is made up of the seven units below. For full ACT accreditation you will need to complete all seven, attend a five-day tuition school and sit the two assessments. This unit is designed as an overview of both the corporate and banking worlds and provides insights into their respective contexts. Firstly, the role of the treasurer is examined and where cash management fits within that role. Most importantly it offers a working definition of good cash management and the resulting benefits to the company. Fundamental cash management concepts are described including the operating cycle, the cash flow cycle, the nature of cash flows, the importance of liquidity, finality, availability and float, where it arises, what causes it and how to reduce it. Secondly, this unit explores the basics of banking. Topics include the role of the central bank, different roles a financial institution can play, types of account and the documentation required to open them, as well as how banks make their money and ways in which companies can seek to reduce their overall banking costs. The impact of Basel III on how banks manage their credit risk and balance sheet is also examined. Lastly this unit reviews the various instruments that are used for making payments and their respective impact on cash flow. Describe the role of treasury and cash management including the factors that influence how those functions are performed within a company. Define cash management from both the bank and corporate perspectives and explain why it is important to companies. Explain the significance of liquidity to a company and the sources, uses and cost of maintaining liquidity. Comprehend important cash management concepts such as the cash flow cycle, float, finality, availability and the time value of money and describe how these concepts are used by cash managers. List the main duties of a bank and describe the differences between types of bank account. Calculate interest on a bank account. Describe the different types of charges levied for bank services and the techniques that can be used to reduce bank fees. Evaluate the advantages and disadvantages of different payment types (electronic and paper–based) and recommend appropriate payment vehicles for different transactions and situations. Be aware of regional preferences and know which payment instruments are favoured in which countries. Explain the impact of Basel III on the banking sector and treasurers. This unit explains how the financial statements are used by different parties to better understand and manage the company. It reviews and defines the components of the balance sheet, income statement, statement of changes in equity and statement of cash flows. It also describes the important ratios used by cash managers and financial institutions in assessing a company’s liquidity and cost of capital. Lastly, this unit reviews the trade financing vehicles that can be used to release cash back into the operating cycle and the specialised bank services designed to help a company manage float. Analyse how a company is being managed through the interpretation of a company’s financial statements. Perform simple financial analysis by computing important financial ratios, such as liquidity, gearing and performance ratios. Critically assess accounts receivable and accounts payable in order to recommend how the organisation can optimise working capital. Recommend improvements to the cash conversion cycle through the calculation of the cash conversion cycle and the value of trade discounts. Identify the ways in which cash can be released back into the operating cycle using trade financing vehicles. Evaluate the benefits of banking services designed to manage float, and quantify the benefits of using a lockbox. Each country has its own clearing and settlement systems to handle both paper and electronic payments, and with the exception of the Single Euro Payments Area (SEPA), these systems are usually not compatible. When payments are made between different countries, therefore, it is necessary to use intermediaries to facilitate the transfer of funds and the handover from one system to another. In this unit we examine and illustrate the primary types of clearing and settlement systems found worldwide, many of which follow the same basic format and principles. We then discuss the process of moving money from one system to another, describing the international banking infrastructure, the major players, their roles and the different ways in which international funds transfers are affected, both electronic and non–electronic. The only thing of which the cash manager can be certain is that cross–border payments involve additional expense and processing time. As most cash managers discover, there comes a point where the value and/or volume of cross–border transactions is such that it becomes more efficient and cost effective to maintain foreign currency (FCY) accounts to make and receive payments. We explore the options available for the location of such accounts as well as discussing the advantages and disadvantages of each option. Finally, we examine the role played by trade vehicles in mitigating the risk inherent in international transactions. Explain the challenges and issues in making international payments and collections. Differentiate between the various types of clearing and settlement systems. Determine the most appropriate payment method for making international payments. Illustrate the role of the key players in making electronic and non–electronic cross–border payments. Determine how international payments and collections can be made more efficiently. Evaluate the optimal location for a foreign currency account. Evaluate the options available to the cash manager in using trade vehicles to mitigate risk in international transactions. This unit highlights the importance of forecasting and examines the more common methods used by cash managers. A good forecast is an essential tool in managing a company’s liquidity, not just for short–term day–to–day cash management but also for medium–term investment and borrowing. It is also instrumental in managing risks, enhancing returns and maintaining financial controls. Cash forecasting tools range from the simple spreadsheet to sophisticated computer models integrated into a company’s enterprise–wide resource planning (ERP) system. What is most important, however, is that the technique selected is fit for the purpose, reliable and accurate. As a next step, this unit discusses the investment process and reviews the most commonly used short–term investment instruments used by cash managers in managing liquidity. It also explains some of the essential calculations used for computing yields and differentiates between conventions used for different instruments. Due to the intertwined nature of the borrowing and investment topics (one company’s debt is another’s investment) many instruments that are covered here are also referred to in the short–term borrowing topic albeit from a different context. The last topic covered is short–term borrowing, with a focus on external sources of financing. This complements the information provided in Unit 2 where the trade financing vehicles were discussed. In addition to explaining the process and calculations used in determining the all–in cost of borrowing, it also addresses the issues of loan documentation. Assess the different purposes for which treasury uses the major cash flow forecasting techniques. Construct a forecast using the information provided. Recommend any possible future courses of action having reviewed the implications of cash forecasts. Recommend an appropriate investment strategy based on the assessment of the characteristics of short–term investment vehicles. Determine the optimal investment strategy by comparing interest rates on investment instruments. Recommend a financing strategy based on the characteristics of short–term financing instruments available to the treasurer. Determine the all–in–cost of financing and the implications of loan documentation. There are many factors that influence how a treasury is organised and supported. This unit takes a broad look at the issues, both financial and non–financial, internal and external, that determine the optimal structure for a company and how that is supported through the financial institutions and technology. Initially we review the advantages and disadvantages of a centralised treasury and the many specialised vehicles treasury can use to gain economies of scale, outsourcing functions and optimise tax efficiencies. We then examine the many roles a bank can play and the process a company goes through in selecting its cash management banking partners. As companies manage increasingly geographically dispersed organisations and multiple banking relationships, technology plays an important role in facilitating the communications and processes. This unit discusses the cash management systems that are currently available, implementation challenges and system security issues. Finally, treasury is subject to both internal and external constraints. No discussion of the treasury organisation would be complete without reviewing the policy, regulatory and tax issues. Although, as a general rule, cash management is not the driving factor behind tax planning, any and all cash management activities and structures will have tax consequences, positive or negative. These need to be taken into account when deciding on an appropriate cash management structure. Evaluate the advantages and disadvantages of different treasury structures, from centralised to decentralised. Recommend appropriate treasury structures for different scenarios. Recognise the importance of bank relationship management, and the various roles that banks fulfil for treasury. Understand the bank selection process and how the request for proposal (RFP) is used to select a banking relationship. Critically analyse the role that technology plays in supporting treasury. Evaluate the functionality offered by different treasury systems. Assess the issues when implementing new technology, reviewing performance and ensuring system security. Explain the importance of treasury policies and procedures and how they can be used to develop key performance indicators to measure treasury performance. Evaluate the regulatory and taxation issues that particularly impact cash management decisions and structures. The netting concept was introduced in an earlier unit as the basis for one of the settlement system types, net settlement systems (NSSs). In this unit we examine how netting techniques are used internally for managing cross–border liquidity companywide and making inter–company transactions more efficient. Although a very simple concept, multilateral netting can be quite complex to perform. It is one of the major tools used by companies with a centralised treasury or an in–house bank. Although the emphasis in this unit is on inter–company netting, it is also a technique that is used to realise considerable cost savings in industries where there are frequent two–way flows between participants. The next step is to apply the netting concept to inter–company lending as internal sources of funds are usually more cost–effective than external borrowing. Offsetting deficit cash pools against surplus cash pools can be very cost effective as it reduces negative balances and eliminates the spread taken by banks on borrowing and investing. In this unit we examine the most used techniques for inter–company lending, including notional pooling and cash concentration, and how these essential cash management techniques are used by companies for cross–border liquidity management. In addition to the general information provided in Unit 4, the specific regulatory, tax and practical challenges surrounding the successful implementation of notional pooling and cash concentration are considered in more detail. No discussion of international cash management would be complete without a review of foreign exchange (FX). This unit reviews what a cash manager needs to understand about foreign exchange; the terminology and the basic techniques and conventions used by traders. It also explains the calculations cash managers are most likely to use; the spot, forward and swap transactions. Doing business internationally inevitably brings new risks and exposures that the cash manager has to measure, monitor and manage. This unit identifies those risks and provides an introduction to some of the techniques and tools used for managing risk, with particular emphasis on managing foreign exchange risk. Note: The accounting aspects of hedging are beyond the scope of this syllabus. Perform a cost–benefit analysis to justify the case, qualitatively and quantitatively, for implementing a multilateral netting system. Evaluate how a netting centre can be used as a platform for further liquidity management efficiencies. Recommend appropriate cross–border liquidity management vehicles. Discuss the advantages and disadvantages of a proposed structure for managing global liquidity. Evaluate the tax, legal and regulatory issues associated with cash pooling. Use spot, forward and spot calculations showing when it is appropriate to use each of them. Formulate a strategy for managing the risks involved in doing business internationally. Recommend vehicles to mitigate different types of risk, especially foreign exchange risk. The impact of tax, regulatory and legal issues and constraints. This unit examines some of the most prevalent structures that have evolved over time, both traditional and new, to satisfy the operational, governance and liquidity management needs of organisations. There are no universal solutions, however, and the challenge to the treasurer is to put in place one that achieves the company’s primary cash management objectives, is appropriate for the countries in which the company does business and does not create adverse tax or regulatory issues. The final element is to provide the international context and while it is beyond the scope of this manual to cover the entire world, this unit focuses on areas that are of primary importance to the majority of companies. By illustrating how cash is managed in these local environments, the treasurer gains insights into appropriate structures when dealing with those regions. The US and SEPA have been highlighted, being two of the major trading partners for the rest of the world. They are also important to cover due to the unique characteristics of the specialised cash management vehicles in these areas. Lastly, this unit also provides a series of case studies providing insights into how companies manage their cash and liquidity in different parts of the world and with a specific focus that is appropriate to companies in that region. Evaluate how factors such as treasury organisation, legal structure and regulatory constraints influence account structures. Assess how in–country footprint impacts cash and liquidity management options. Recommend a banking structure that will support the treasury objectives. Construct an account structure that is appropriate for different regions of the world. There are no entry requirements for this certificate. You are eligible to fast track onto Units 3-7 of the Certificate in International Cash Management. Take a look at the accountancy exemptions information to see which exemptions apply to you. If these accounting exemptions apply to you, you will be able to buy your exemption from the Award in Cash Management Fundamentals at the same time as you buy your Certificate in International Cash Management units. Course materials are online so you can start your studies at any time. You will need to attend a five-day tuition school, these run twice a year in January and July. There are four online assessment windows every year for the exam for Units 1 and 2. There are two assessment windows every year for the exam for Units 3-7. This means you can study until you feel ready and then you can book your assessment time for the next available window. All seven units of the Certificate in International Cash Management are delivered online through the ACT Learning Academy study site. As they are accessible online, you can start your studies any time. There are four assessment windows every year. This means that you can study until you feel ready and then you can book your assessment time for the next available window. Each unit will take you approximately 50 hours of study time to complete, with 350 hours study required in total. We estimate you should be able to complete the course in nine to twelve months alongside your full-time work. When you buy your learning materials you will have access to them for 18 months upon booking. You can complete the learning for all the units in 9-12 months (350 study hours in total), so the 18-month learning licence gives you plenty of time to choose when you want to sit your assessment. They show a guideline of how you can complete the course in either nine or twelve months. You will need to attend the compulsory five-day tuition school in order to proceed to the exam. The school focuses on learning around units 3 to 7 and whilst it does not count towards your assessments, it is a vital part of your exam preparation. Widely seen as the highlight of the programme, it provides an opportunity to build your professional network, share your experiences with the tutors and fellow students, and includes a mock exam component to help you with exam performance. A popular and highly rated feature of the qualification, it gives you the opportunity to get a good understanding of what you need to do to succeed in your assessment, share your experiences within a supportive classroom environment and build long-lasting and valuable professional relationships with other attendees. Our CertICM tutors are leading international cash management professionals, and will guide you through the study materials while offering their own insights and tips. Tuition schools run in Hong Kong, Singapore and the UK. UK tuition school: This is hosted in the countryside with classes during the day and activities in the evening. Instructions on how to book your own accommodation will be provided after your booking has been processed. Hong Kong and Singapore tuition schools: Both these schools are in central locations, so accommodation bookings are optional. Would you like a free sample of the study materials for the Certificate in International Cash Management so that you can try before you buy? You can request for a sample to be emailed to you by filling in your details in the form below. The assessment is one online exam. There are four exam windows each year to choose from. When booking onto the Certificate in International Cash Management you will need to become a student member of the ACT. Your student membership is valid for the duration of your 18 month learning licence, or until you pass your full qualification, whichever is soonest. Remember to take advantage of these benefits - they are an opportunity to broaden your knowledge and network. When you have successfully completed the certificate, you will be eligible to become an Affiliate Member and use the designatory letters CertICM. These are the internationally recognised letters that go after your name that recruiters and employers look out for, because they show you are a very credible candidate. You can find out more about ACT membership here. When you start studying, you buy your online learning materials and student membership at the same time. Your assessment can be booked at a later date, when you feel prepared and ready to sit the exam. The following fee applies if you are eligible for an exemption from the Award in Cash Management Fundamentals. Early booking is recommended to avoid disappointment, as our tuition schools usually become fully booked in advance of this date. An additional benefit of registering early is that you can start your studies now and get a head start on the course. A student membership fee is payable on booking. Your student membership is valid for the duration of your 18-month learning licence, or until you pass your full qualification, whichever is soonest. Following several recommendations, I was keen to gain the qualification to validate and, ultimately, improve my knowledge of this broad and complicated business. Through an improved understanding of the corporate environment and the challenges faced with international cash management, I am now able to apply my knowledge in a more focused and confident manner in discussions with clients. The decision to take the CertICM has been one of the best of my career to date.